The display of toner levels in the software and the printer control panel is an estimate and may not always be accurate. However, you can be assured that your toner is completely filled. Fill/Yield is verified during product development following the testing procedure defined in ISO 19798. Toner is filled to an accuracy tolerance of +/- 3 grams for toner loads 300 grams or less and +/- 1% for loads over 300 grams. However, toner fill is only one of a large number of factors that affect toner yield. Variation in many of the other components in the cartridge can affect the resultant yield. 2. The yield trend for each product is examined on a monthly basis. 3. Yield is adjusted through an EC to the toner load or to other control parameters when the trend indicates a deviation from the claim. All adjustments are intended to keep the lower 90% confidence bound on the average yield as described in the ISO standard above the yield claim. Therefore, some variation in filled toner weight would be consistent with the process outlined above. There will also be variation in end of life cartridge weights due to differences in the amount of residual toner left in the cartridge when they are removed from the printer. It is also useful to keep in mind that in general, measuring full cartridge weights is not necessarily an accurate indicator of toner fill weight. Changes in the design of the toner cartridge itself over time can affect total weight. If the toner percentages are not accurate what can I do? The printer detects toner levels real time. However, if the toner goes empty during a long heavy coverage print job it cannot report this until the end of the job. Therefore you may see the toner level drop quickly from a higher percentage to lower percentage or to zero a short time after the long job is finished. If you want to gauge how much toner is really left in your cartridges look at the prints per cartridge on the cartridge tab instead of the %. In most cases expect to see at least 4000 prints and in many cases 5000+ before seeing issues with empty cartridges. This will depend greatly on the image you are printing, but for the most part is a good gauge. So if the percentage says 40% but prints show 5000 then the cartridge is probably very close to empty. Running shorter jobs at this point would be recommended. If you need to run a longer job. Take this cartrdige out, label it with the percent remaining, and install a new cartridge instead. 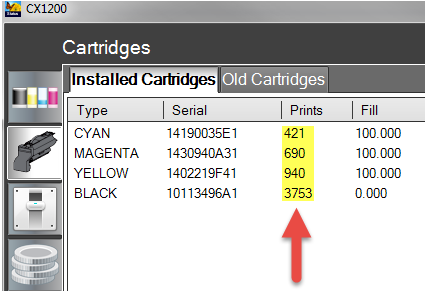 While the percentages shown in the software are rough estimates we have found that the number of prints displayed on the cartridge tab is a much better gauge of how much toner is remaining. 34 Short Paper Error displayed on the printer or half of the printed image is printed with only the yellow toner (CX1200-CX1000).